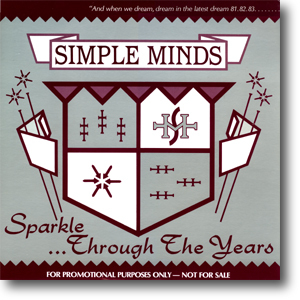 " And when we dream, dream in the latest dream 81.82.83.....84" marks the release of Sparkle In The Rain the phenomenal new album from Simple Minds. " Conceived by Bobby Gale and a team from Virgin Canada, Sparkle Through The Years combined a choice selection of tracks from the forthcoming Sparkle In The Rain and backed them with songs from previous albums such as Real To Real Cacophony, Empires And Dance, Sons And Fascination and New Gold Dream (81,82,83,84).
" Sparkle In The Rain - one further step in reaching the dream of three young Scots, who began writing/performing back in 1977. The band has grown to the current line-up with each release, they become lyrically and muscially stronger, a band that lets their music do the talking, and Sparkle In The Rain definintely has a lot to say... "
This promotional only album was sent to press, music publications and radio stations. Covered in various quotes and sound bites, the smart grey sleeve with unique graphics based on Sparkle In The Rain made it instantly eye catching.
" This Virgin Simple Minds sampler contains five tremendous tracks from their new album, including the first single, Waterfront, as well as six key selections from previous works, including Love Song, Someone Somewhere (In Summertime) and Promised You A Miracle ." Whilst the LP was pressed in enough numbers to make it fairly common today, there's also a highly collectable cassette version which is much rarer. "Always came a time - time was on our side" - Simple Minds - time has come.